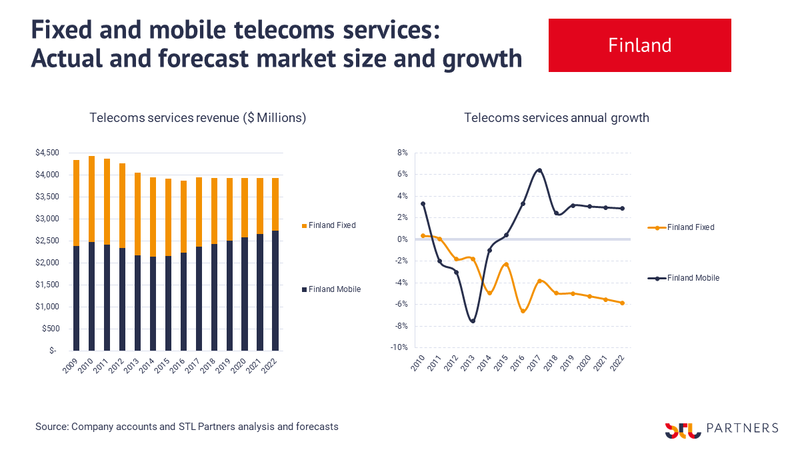 STL Partners' forecasts less than 1% annual growth for global telecom revenue from fixed and mobile services for 2019-2022. 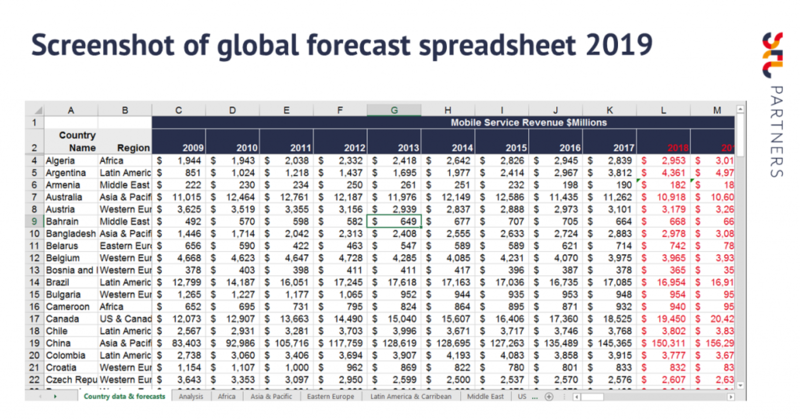 Our telecoms revenue forecast covers eight regions and 94 countries, and includes over 200 charts and a detailed spreadsheet. 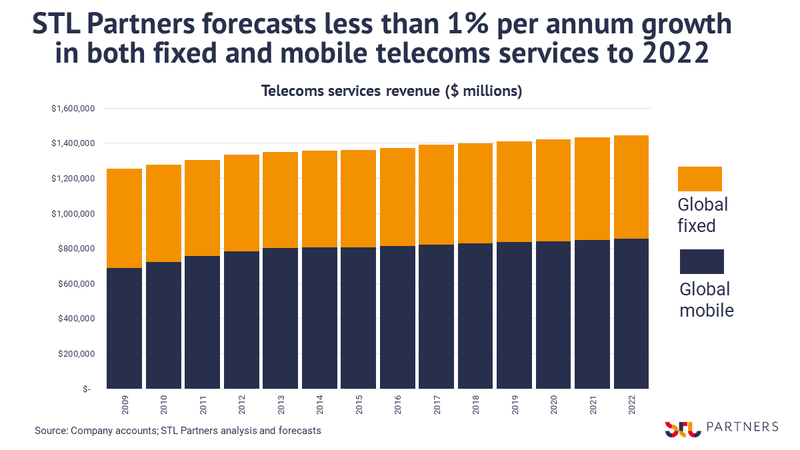 STL Partners’ telecoms revenue forecast is for less than 1% per annum global telecoms services revenue growth for the period 2019-2022. NB If you don’t subscribe to our research yet, you can download a snapshot of telco revenues v GDP growth as part of our sample report series. For fixed and mobile combined, of the ten largest markets, China will grow most at 3.7% pa, and India least at -1.6%. 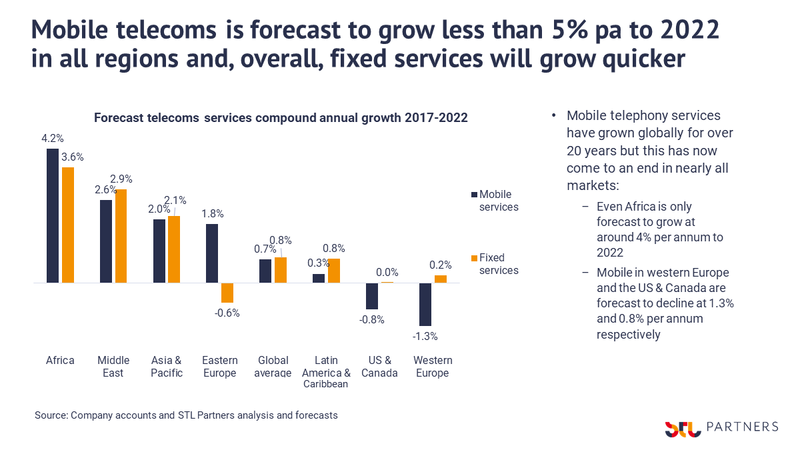 Regionally, Africa will show the strongest growth (4.8% mobile, 3.6% fixed), while western Europe’s mobile market will shrink most (-1.3%) and the North American fixed market will stay flat at 0% growth. 94 individual country forecasts: Algeria, Argentina, Armenia, Australia, Austria, Bahrain, Bangladesh, Belarus, Belgium, Bosnia and Herzegovina, Brazil, Bulgaria, Cameroon, Canada, Chile, China, Colombia, Croatia, Czech Republic, Denmark, Ecuador, Egypt, Estonia, Ethiopia, Finland, France, Germany, Greece, Hong Kong, Hungary, Iceland, India, Indonesia, Iran, Iraq, Ireland, Israel, Italy, Japan, Jordan, Kazakhstan, Kenya, Kuwait, Latvia, Lithuania, Malawi, Malaysia, Maldives, Mali, Mexico, Moldova, Montenegro, Morocco, Netherlands, Nigeria, North Macedonia, Norway, Oman, Pakistan, Palestinian Territory, Paraguay, Peru, Philippines, Poland, Portugal, Qatar, Romania, Russia, Rwanda, Saudi Arabia, Serbia, Singapore, Slovakia, Slovenia, South Africa, South Korea, Spain, Sri Lanka, Sudan, Sweden, Switzerland, Syria, Taiwan, Tanzania, Thailand, Tunisia, Turkey, Ukraine, United Arab Emirates, United Kingdom, United States, Uruguay, Venezuela, Zimbabwe. If you want to talk to us in more detail about any of the numbers in the telecoms revenue forecast, reach us through your account director or please fill out our contact form.